There are several fantastic Imperial IPAs coming out of Ohio right now (Chillwave, Hop JuJu, …), but until very recently I don’t think any of the Columbus breweries were bottling an Imperial IPA. That’s not to say that no Columbus breweries make an Imperial IPA (CBC’s Bodhi immediately comes to mind), but until now your choices were limited to pints and growler fills. While I like a growler every now and again, bottles are just more practical—they store better, you don’t have to commit to drinking 64 oz (or 32 oz) in an evening, and bottled beer is usually cheaper. So when I came across Elevator Brewery’s Big Vic Imperial IPA while perusing the aisles of Kenny Road Market I didn’t hesitate to bring home a 6 pack to give it a try. Big Vic fills the glass with a clear deep amber liquid topped by a creamy looking white head that is 1-2 cm high. The head dies off pretty quickly, but a few millimeters persist on top of the beer until the very end, and it does leave a nice pattern of lacing when swirled onto the inner walls of the glass. The nose is a little weak for an Imperial IPA, but the scents that are present are interesting. It’s fruity, but not with the standard grapefruit/citrus/pine flavor, instead the fruity esters are a little more exotic tending toward oranges, pineapples and peaches. Those same fruity notes greet your taste buds as you take your first drink. The word juicy comes to mind when trying to describe this beer. Some pine flavors come on toward the finish, but never gain the upper hand. It’s got a solid malt base that’s not too sweet and nicely compliments the hops. The bitterness is relatively low for an Imperial IPA, although it does grow and linger for a little longer as you get toward the end of the glass, and the beer warms. The mouthfeel is medium bodied and has both a creamy texture and a little oily stickiness. To be honest I wasn’t expecting much from this beer. 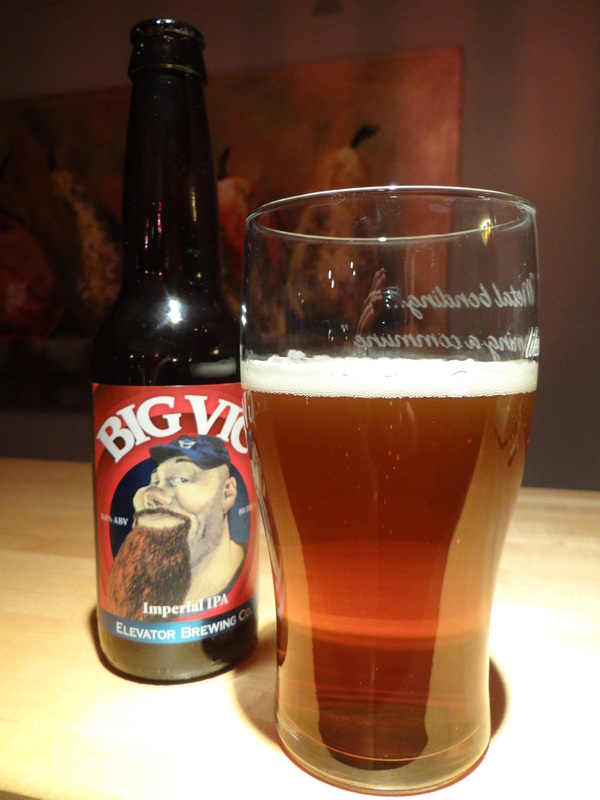 The other bottled Elevator beers that I’ve tried (Dark Horse Lager, Three Frogs IPA, Mogabi Hoppy Wheat, …) have been pretty average, but I was pleasantly surprised by Big Vic. The use of wheat in the malt bill makes for a smooth beer and the hops used impart a lot of juicy, fruity flavors that combine to make for an easy drinking, tasty beer. I drank Big Vic head to head with CBC Bodhi and thought that it held its own. The malt base on Big Vic is superior in my opinion (the malts in Bodhi are too sweet for my liking), and while the aroma of Big Vic is no match for Bodhi, the fruitiness in the taste is comparable, albeit with an emphasis on different subset of fruits. I should also point out that Big Vic is $9 a 6-pack while Bodhi runs $16 for a 64 ounce growler. If you like Imperial IPAs that lean toward tropical fruit flavors and dial back the bitterness, you owe it to yourself to give Big Vic a try. I know it won’t be my last purchase.